500 Gallon Elliptical Tank 57" x 82" x 36" | U.S. Plastic Corp.
HomePolyethylene Tanks Horizontal Tanks Elliptical Tanks 500 Gallon Elliptical Tank 57" x 82" x 36"
500 Gallon Elliptical Tank 57" x 82" x 36"
This 500 gallon elliptical tank with sump is 82"long, 57" wide and 36" high. The nominal wall thickness is .310". The weight of the tank is 167 lbs. Sump is 11.25" long, 6.0" wide and 2.5" deep. It comes with a 3/4"FNPT and a 1-1/4" FNPT Polypropylene fitting in the sump and an 8" lid on top. The cradle and bands for this tank are part number #9861. 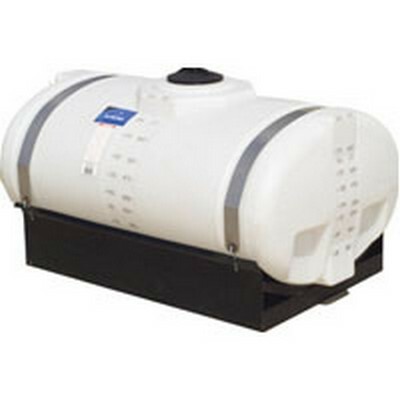 200 Gallon Elliptical Tank 41" x 66" x 26"
300 Gallon Elliptical Tank 48" x 70" x 30"
400 Gallon Elliptical Tank 57" x 70" x 36"
500 Gallon Elliptical Tank w/8.5" Deep Sump 57" x 82" x 36"
600 Gallon Elliptical Tank w/6" Deep Sump 64" x 84" x 46"
750 Gallon Elliptical Tank 69" x 89" x 42"
750 Gallon Elliptical Tank w/8.5" Deep Sump 69" x 89" x 42"
850 Gallon Elliptical Tank 69" x 89" x 46"
850 Gallon Elliptical Tank w/8.5" Deep Sump 69" x 89" x 46"
1000 Gallon Elliptical Tank 78" x 90" x 49"
1000 Gallon Elliptical Tank w/8.5" Deep Sump 78" x 90" x 49"
1250 Gallon Elliptical Tank 78" x 92" x 60"
1600 Gallon Elliptical Tank 78" x 138" x 49"